Fresh off the cruise ship at Laem Chabang Port, you might be wondering what you can do around Laem Chabang. Being the largest seaport in Thailand, it is a trading hub in the Eastern Seaboard with many tourists nowadays disembarking left and right. 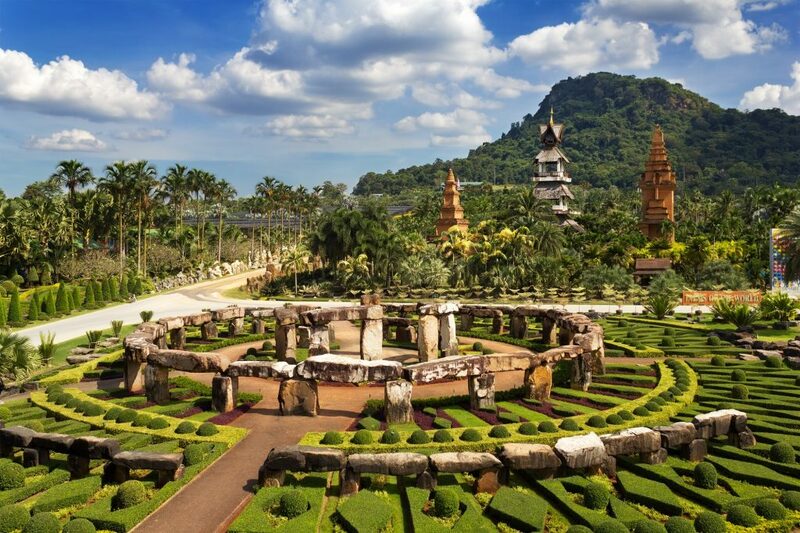 Luckily, Laem Chabang is surrounded by cities such as Pattaya, Chonburi, and Sri Racha, all less than an hour’s drive away with a myriad of things to do and see. Pattaya’s tourism is already matured, but venture out to Chonburi and Sri Racha, and you’ll enjoy the quieter and simpler things in life. 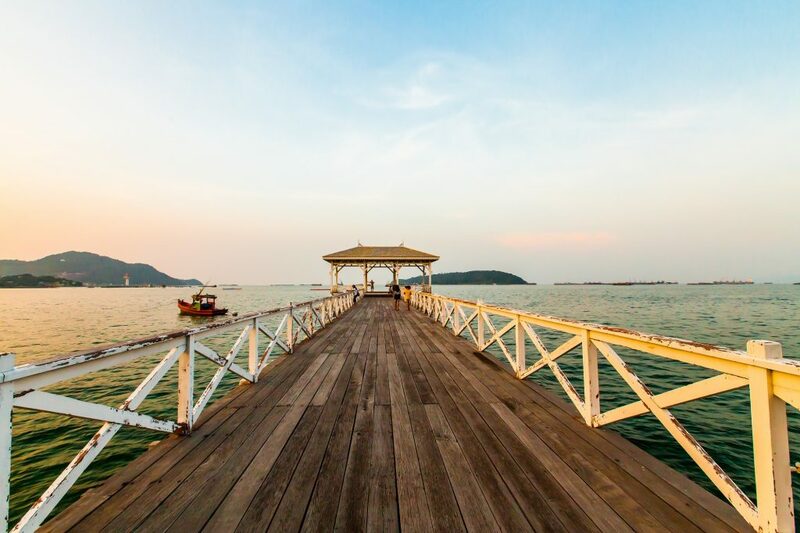 Without waiting any further, let’s check out the 9 cool things you can do around Laem Chabang. If you’re interested in flowers, trees and landscape gardens, this is certainly the place for you to spend a pleasant afternoon. The 2.4 square-kilometer garden is designed as a theme park with various highlights. The Stonehenge garden and the 17th century French garden host some of the most beautiful flowers in the world. There are also over 670 species of orchids and even an elephant talent show for everyone to see. A big tip from us while you’re there is to rent a bicycle at the entrance. It’s certainly the best way to tour the garden, and you’ll see more of everything that way! There are numerous floating markets in the kingdom, but none like this one in Pattaya. 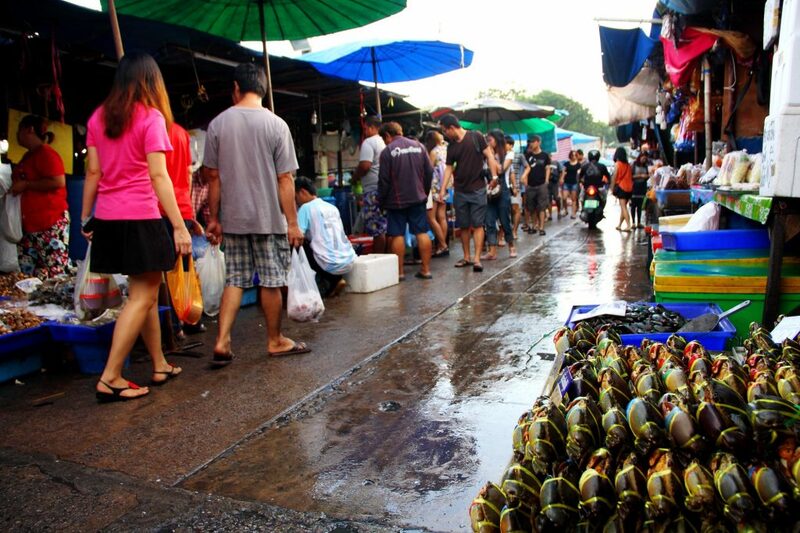 The actual name of the market is the “Four Regions Floating Market”. Why? Because the market is divided into four regions of Thailand: The north, northeast, south and central. Traders, farmers, and fishermen in boats float along the water, selling various fresh produce from each region of the country. Take a boat tour through the market, or stop and bargain for something. The local spices, handicrafts or colorful vegetables and fruits are surely worth your money. The crowds on Pattaya Beach can indeed be a bit too overwhelming. So, head a little further south, and Jomtien Beach might be what you’re looking for! This particular stretch of fine white sand is an oasis for those looking for a tranquil time. Since it’s not as big or as crowded as Pattaya beach, it’s much more peaceful. 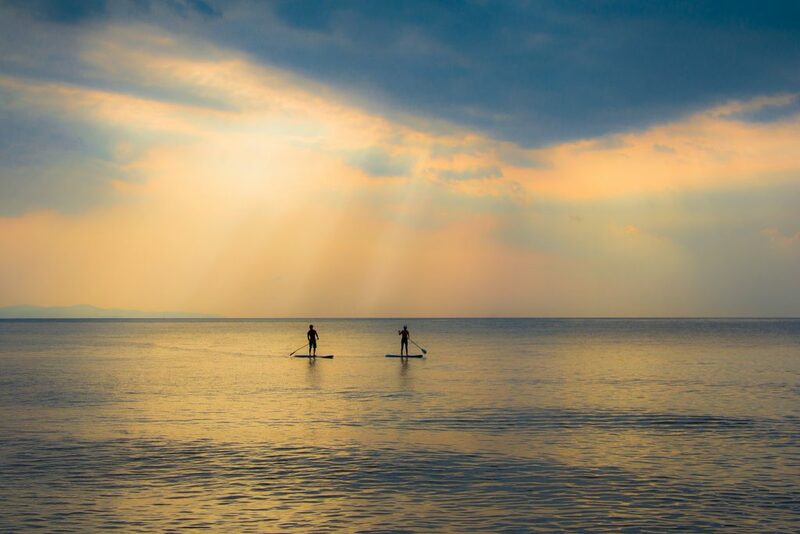 A plethora of activities and watersports such as jet skiing, parasailing, and windsurfing are available to keep you active. Plenty of restaurants along the beach serving fresh, mouthwatering seafood are also there to tease your growling stomach. Its striking appearance seen from miles away, the 130 meter-high Buddha Mountain is one of the most interesting landmarks in the region. 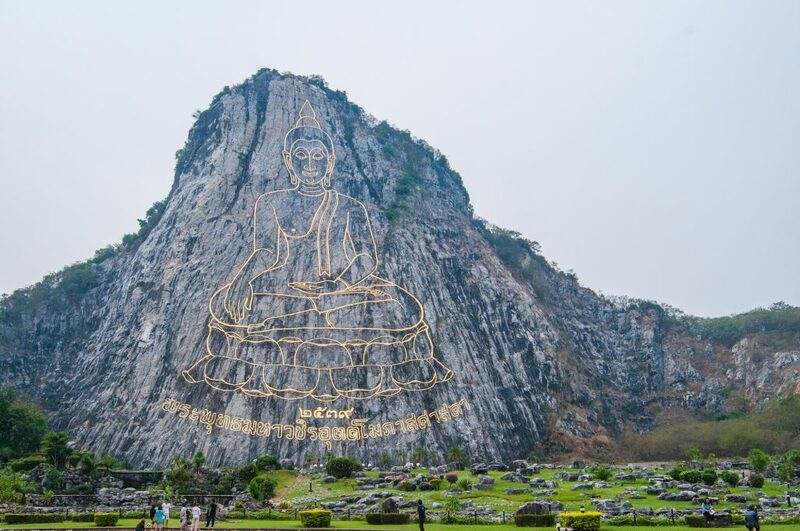 Originally created in 1996 to commemorate the 50th anniversary of King Rama IX’s reign, the image of the Buddha on the mountain was carved using laser technology and then inlaid with gold leaves. The mountain also has some pleasant landscape gardens and lotus ponds, giving an air of quietude about the place. An island located just a few minutes off the coast of Pattaya, you can travel to Koh Lan by ferry which leaves every 30 minutes. With countless breathtaking sceneries, the place is a tropical paradise and has some great options for those who love Thai food especially. With 6 different beaches to see, each beach has its own unique vibe to keep you entertained. Seafood lovers, look no further! If you’re looking to buy fresh seafood, there is no better place than Ang Sila Old Market 133 Years. A fresh seafood market with a very local feel, there are not many tourists around here. A source of seafood such as fish, crab, squid, shrimp, shellfish, and crayfish, there various types to choose from, fresh or processed. Furthermore, the price is friendly, and some shops can even cook for you. If you’re looking to spend some time outdoors with your family,then Khao Kheow Open Zoo is definitely worth a visit. The zoo is located at the base of Kheow Mountain, and hosts over 300 animal species in an open environment. We highly recommend the night safaris in particular, as it’s a great place for the youngsters to marvel at the animals here on show. A place to find your peace of mind, Bang Phra Reservoir is beautiful, and surrounded by lots of nature. A relaxing time here will surely make you realize how simple your life can be. You can enjoy cycling around the place, have a picnic with your loved ones, watch some birds, and immerse yourself in the peaceful atmosphere around the vast reservoir. Koh Sichang is one of the larger islands just off the coast of Chonburi with sprawling sandy beaches and a densely forested interior. This island is a favorite of Bangkokians who are looking to spend their weekend or even a day trip at the sea without going too far. 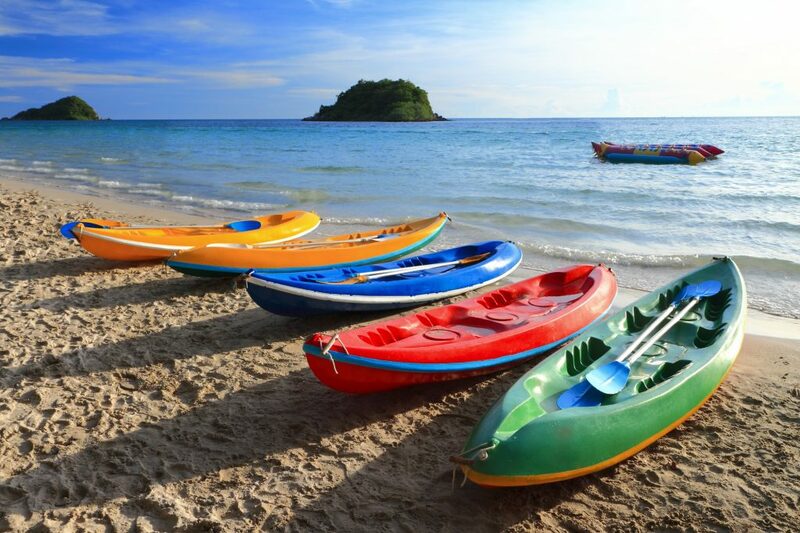 With a picturesque atmosphere and a laid-back pace of life, you can enjoy the clear waters, impressive sunsets, and activities such as biking, snorkeling, and kayaking. Koh Sichang is easily accessible, too. The nearest ferry dock is located at Sri Racha, north of Pattaya, where a regular service connects to Koh Sichang. Also, did you know that Bangkok is only a 2-hour drive away? That’s right! The big, bustling capital of Thailand can be easily accessed by car or bus. Known as the “City of Angels”, Bangkok is full of attractions for you to enjoy day or night, so a trip there is never a bad idea. After all, you can tour over the 5 iconic temples in Bangkok’s old quarters or sample some delectable street food at Chinatown to spice up your trip. That’s it for the 9 cool things for you to do around Laem Chabang (and Bangkok, for that matter). So, hit the docks, and go out to explore!